Puerto Madryn is the gateway to the animal kingdom in Patagonia. Here you can get up close and personal with all kinds of animals including penguins, sea lions, elephant seals, whales and plenty of different land animals and birds. Near Puerto Madryn, you will also find the city of Trelew where you can find one of the best dinosaur museums in the world. There is only one airline that flies directly to Puerto Madryn, Andes Líneas Aéreas. Its an extremely small airline that is government owned and is operated by the military of Argentina. I was never able to purchase a flight with the company since their website never worked properly and its easier to book with other airlines. 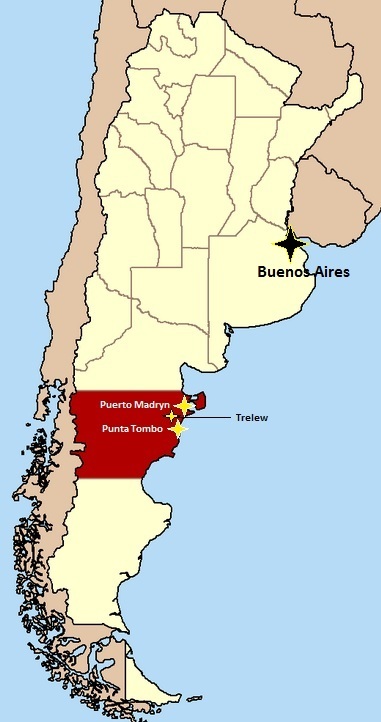 The majority of people fly into Trelew, about an hour away from Puerto Madryn. There are taxis and regular shuttles that can take you from the Trelew airport to Puerto Madryn. Both LAN Airlines and Aerolineas Argentinas fly regularly into Trelew. It’s about a 2 hour flight from Buenos Aires. Click Here for a complete list airlines in Argentina. The best time to travel to Puerto Madryn really depends on what kinds of animals you want to see. There is a different high season for different animals, the main high season is between is September thru February and the best time being around November. In late November you can see a great combination of animals.